It’s been a pretty busy year for publications on Medium. I’ve been watching as many of the publications on this list have grown drastically since the start of the year; it’s always fun to observe growth, especially when there’s natural competition. As you may know, Top Publications by Smedian tracks over 8,200 Medium publications and ranks them by their number of followers to help readers and writers find the right ones for them. 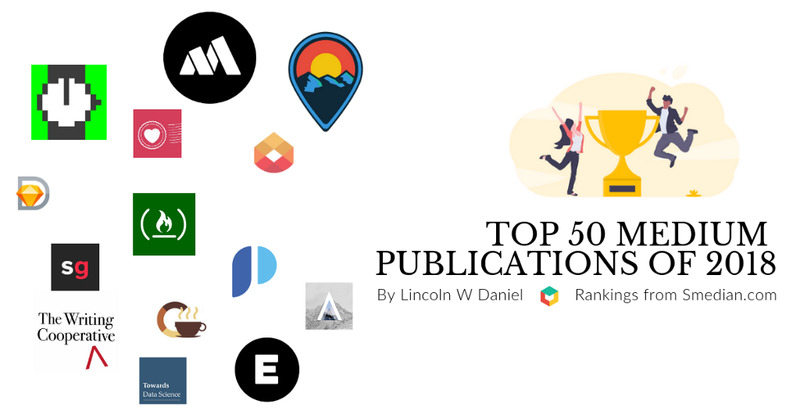 This article ranks the top 50 publications of 2018; visit Toppubs.Smedian.com to see the current rankings of the top 100 Medium publications. In case you’re wondering what Smedian is, check out this article. Let’s get into the rankings for 2018! freeCodeCamp covers Technology and had 522,624 subscribers at the end of 2018. freeCodeCamp grew form 359,967 subscribers in 2017, when they finished as the #3 top publication, to where they are now; that’s growth of over 162k subscribers in just a year. Kudos to Quincy and his editorial team for that feat. They are currently growing by 439 followers per day to start 2019. The Mission covers Tech and had 505,908 subscribers at the end of 2018. The Mission grew by over 109k subscribers since 2017, but fell from their ranking of #1 to #2 in the same time. They are currently growing by over 212 subscribers per day to start 2019. Hacker Noon covers Technology and had 412,116 at the end of 2018. Hacker Noon has seen extraordinary growth in the last year since 2017; growing by nearly 147k subscribers, the publication that brings the best stories from the greatest minds in tech has raisen from #7 to #3 in just 365 days. Great props to David Smooke and team for this amazing growth. Keep on rising. They are growing by over 346 subscribers per day to start 2019. Their editorial team is always accepting new writers via Smedian; request to contribute here. The Economist covers Politics and had 408,162 subscribers at the end of 2018. Unfortunately, although The Economist grew by over 31k subscribers, they fell two spots from #2 since the end of 2017. They are growing by 15 subscribers per day to start 2019. Personal Growth covers Life and had 406,571 subscribers at the end of 2018. While they grew by nearly 98k subscribers since the end of 2017, they kept at the #5; they are one of two publications in the top 10 from last year to have not budged in their ranking. The publication is growing by 181 subscribers per day to start 2019. The Startup covers Startup and had 405,808 at the end of 2018. They also stayed at their position of #6 from the end of 2017 despite growing by 131k subscribers since then. They are growing by 355 subscribers per day to start 2019. Startup Grind covers Entrepreneurship and had 367,208 subscribers at the end of 2018. Although they grew by about 32k subscribers since the end of 2017, they fell from their ranking of #4 to #7 during that time. They are growing by 98 subscribers per day to start 2019. The editors are new writers via Smedian; you can request to contribute here. The Twitch Blog covers none other than Twitch and had 337,436 subscribers at the end of 2018. They rose from nothing to their current position in the top 10 during the last year. They are growing y 320 subscribers per day to start 2019. The Washington Post covers News and had 304,791 subscribers at the end of 2018. Although they grew by nearly 54k subscribers since 2017, they fell one spot from #8 in the same time. The Coinbase Blog covers Ethereum, and, I assume, other blockchain coins. They had 293,739 subscribers at the end of 2018. It was not in the top ten a year ago, but it has quickly climbed the ranks and will continue to do so as it is growing by 207 subscribers per day. Better Humans covers Productivity and had 278,543 subscribers at the end of 2018. A year ago, they were in the top ten, but, despite growing by 78k subscribers, they have be pushed down one spot from #10 since then. They are one of the two publications from last year’s top 10 to no longer be in that segment. The publication is growing by 228 subscribers per day to start 2019. UX Collective covers User experience and had 234,199 subscribers at the end of 2018. The publication is growing by 209 subscribers per day to start 2019. The Coffeelicious covers Culture and had 206,092 subscribers at the end of 2018. They are the other publication of the two from last year’s top 10 to no longer be in that segment because they only grew by about 4.5k subscribers in the last year; they fell 4 spots from #9 since the end fo 2017. The publication is growing by 7 subscribers per day to start 2019. ThinkGrowth covers Business and had 179,914 subscribers at the end of 2018. The publication is growing by 55 subscribers per day to start 2019. UX Planet covers User Experience (UX) and had 178,182 at the end of 2018. The publication is growing by 176 subscribers per day. Product Hunt covers Tech and had 171,965 subscribers at the end of 2018. The publication is growing by 9 subscribers per day. Due covers Business and had 161,910 subscribers at the end of 2018. Towards Data Science covers Data science and had 158,061 subscribers at the end of 2018. If this list is any indication of our society’s interests during this time, this publication shows that the popularity of data science is on a rise; Towards Data Science grew from outside of Smedian’s top 100 publications ranking to being in the top 20 all during 2018. That’s admirable. Great work, Ludovic and team. The publication is growing by 421 subscribers per day to start 2019. Marketing and Entrepreneurship covers Marketing and had 152,905 subscribers at the end of 2018. The publication is growing by 11 subscribers per day to start 2019. Be Yourself covers Life and had 152,898 subscribers at the end of 2018. The editor, Joel, is an old friend who continues to run this publication very well on his own. Keep up the great work! The publication is growing by 17 subscribers per day. The Atlantic covers Politics and had 152,451 subscribers at the end of 2018. The publication is growing by 38 subscribers per day. This publication is probably defunct; it covered Hillary Clinton’s 2016 Presidential campaign and had 144,194 subscribers at the end of 2018. It isn’t growing, so you probably shouldn’t follow it; we’ll eventually remove it from our rankings. Muzli covers Design and had 142,310 subscribers at the end of 2018. The publication is growing by 93 subscribers per day to start 2019. The Writing Cooperative covers Writing and had 139,583 subscribers at the end of 2018. The contributors, led by a great editorial team, of this publication aim to help each other be better writers everyday. Keep up what you’re doing, Sand and team. The publication is growing by 129 subscribers per day. Their editorial team is always accepting new writers via Smedian; you can request to contribute here. The Angelist Blog covers Startup and had 136,019 subscribers at the end of 2018. The publication is growing by 2 subscribers per day to start 2019. Google Design covers Design at Google and had 135,381 subscribers at the end of 2018. The publication is growing by 119 subscribers per day to start 2019. Prototypr covers Design and had 126,225 subscribers at the end of 2018. The publication is growing by 86 subscribers per day and is accepting new contributors via Smedian; you can request to contribute here. Strong opinions and shared thoughts on design, business, and technology. Since 1999. Signal v. Noise covers Business and had 117,404 subscribers at the end of 2018. The publication is growing by 29 subscribers per day to start 2019. Startupsco covers Founders and had 115,831 subscribers at the end of 2018. Crushing It covers Startup and had 114,145 subscribers at the end of 2018. Life of Thought covers Philosophy and had 113,527 at the end of 2018. P.S.I Love Your covers Love and had 112,369 subscribers at the end of 2018. The publication is growing by 114 subscribers per day to start 2019. Their editors are accepting new contributors via Smedian; you can request to contribute here. Electric Literature covers Books and had 94,224 subscribers at the end of 2018. The publication is growing by 75 subscribers per day to start 2019. Fortune Insiders covers Business and had 91,857 subscribers at the end of 2018. The publication is growing by 40 subscribers to start 2019. OMGFacts covers Life and had 87,039 subscribers at the end of 2018. The Nib covers Comics and had 86,321 subscribers at the end of 2018. The publication is growing by 5 subscribers per day. ART + marketing covers Art and had 85,522 subscribers at the end of 2018. The publication is growing by 13 subscribers per day and is accepting new contributors via Smedian; you can request to contribute here. The Billfold covers Money and had 85,044 subscribers at the end of 2018. NewCo Shift covers Business and had 84,481 subscribers at the end of 2018. Financial Times covers Finance and had 84,462 subscribers at the end of 2018. The publication is growing by 18 subscribers per day to start 2019. Google Developers covers Technology by developers at Google and had 83,661 subscribers at the end of 2019. The publication is growing by 67 subscribers per day to start 2019. Slackjaw covers Humor and had 82,977 subscribers at the end of 2018. The publication is growing by 49 subscribers per day to start 2019. Entrepreneur’s Handbook covers Startups and had 82,628 subscribers at the end of 2018. This publication has seen massive growth in the last year. It looks like that’s going to continue because EH is growing by 103 subscribers per day to start 2019. Dave and team are always looking for new contributors via Smedian; you can request to contribute here. Human Parts explores the patchwork of the human condition through experimental and traditional personal writing. Human Parts covers Personal stories and had 82,508 subscribers at the end of 2018. The publication is growing by 4 subscribers per day to start 2019. BRIGHT Magazine covers Education and had 82,506 subscribers at the end of 2018. Calendar covers Productivity and had 81,909 subscribers at the end of 2018. The Intercept covers Criminal justice and had 80,454 subscribers at the end of 2018. The publication is growing by 3 subscribers per day. That’s it for the top 50 publications of 2018, but there were so many more impressive publications that rose to prominence in 2018. You can browse the top 100 ranking anytime on Toppubs.Smedian.com. As a final note, if you want to be on this list next year and need ideas on how to grow your publication, check out the Marketing & Growth Hacking publication (which was the #75 top publication for 2018). Furthermore, if you’re looking to contribute to a publication, there’s no better place to look than Smedian.com. Happy New Year; I’m wishing you growth. The Top 50 Medium Publications of 2018 was originally published in Marketing And Growth Hacking on Medium, where people are continuing the conversation by highlighting and responding to this story. Biz Tips: The Slow Death Of Medium: Will It Degrade Into A Syndication Tool?